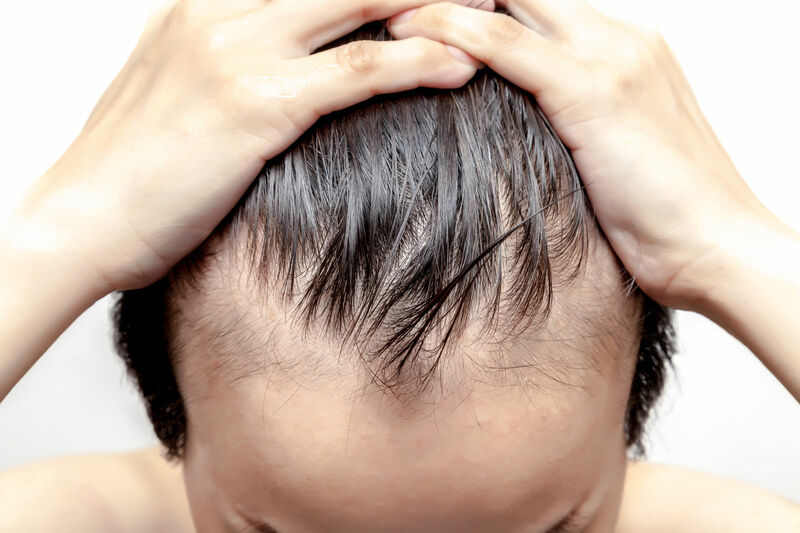 Male pattern baldness or androgenetic alopecia is a condition that involves thinning of hair in specific areas of the scalp in response to hypersensitivity to a hormone - Dihydrotestosterone, (DHT). This hormone acts on the root of follicles causing a gradual shrinking, (miniaturization), and finally death of these follicles. It commonly occurs in crown region in specific patterns like inverted V shaped on edges of hair margin, receeding of the hair line, sparseness of crown region or vertex of the head. In order to determine the best course of treatment for hair loss, it is important to understand the progression. The Norwood-Hamilton scale is the generally accepted standard to measure the extent of hair loss in men. Stage I: shows an adolescent hairline, generally located on the upper brow crease. There is no hair loss at the hairline or crown of the head. Stage II: demonstrates the progression to an adult hairline, which sits slightly above the upper brow crease. Hair loss at this stage is very mild and usually concentrated at the frontal hairline. Stage III: is the earliest stage of hair loss considered cosmetically significant enough to be called “baldness” according to this scale. At this stage, most men show a deep symmetrical recession at the temples, which are either bare or only sparsely covered with hair. The vertex figure here shows the additional thinning of the hair at the crown of the head. Stage IV: includes a deepening recession at the front of the head in the temple areas. Hair loss at the crown is evident and often a bridge of moderately dense hair will separate hair loss at the front of the scalp from that at the vertex or the crown of the head. The sides of the head are typically well-covered with hair. Stage V: marks the beginning of severe hair loss. While there remains a small separation between the loss of hair at the hairline and the loss of hair at the crown, the band of hair between the two is much thinner and narrower. Hair loss at both the crown and the temporal regions are larger and more distinct. Stage VI: The bridge of hair that once separated the front of the head from the crown is now almost fully lost, only a few sparse strands may persist. The remaining hair now forms a horseshoe shape around the baldness concentrated in the center of the scalp. Hair loss on the sides of the head will also extend further at this stage. Stage VII: The most advanced stage of hair loss, only a wreath of thin hair remains on the sides and back of the scalp. The treatments offered depend on the stage of hair loss. Male pattern baldness is generally managed with using a hair spray/gel generally at night, an oral medicne which is a DHT blocker, any nutritional deficit managed with hair nutrient medicine. A Hair mesotherapy or PRP may be added to arrest initial hair loss or initiate hair regrowth. For Late stage androgenetic alopecia, hair transplant becomes the only option. It is however important to undergo hair transplant only in stable cases ( no more active hair loss ). It is important to understand in male pattern baldness that it is a progressive condition and hence treatment is long term. The treatment isnt curative but more of continued inhibition of the DHT hormone.